People with Alzheimer’s or another form of dementia may take multiple medications. And because the risk of missing a dose or confusing pills is so high for these individuals, someone should oversee the process. But what happens when your loved one resists or refuses to take medication? This can happen for a variety of reasons – they don’t remember or understand why they need to take it, or they don’t want to take orders and feel like they’re not in control. We never want to force someone to take a medication. It’s their home, and we want to honor their choice. But we also know some medications are critical to a person’s health. While we need to keep safety in mind, you can use these four strategies – and a little creativity and flexibility – to help your loved one feel more comfortable about taking their medication. We all have a particular time of day when we’re at our best. Some people are grumpy in the morning and may not want to take medication right then. But they may be more alert and receptive to it later in the day. The time of day when someone has to take a medication isn’t always set in stone. One of the advantages of the home-care setting is the flexibility it offers to fit in with the individual’s routines. After you check with their doctor or pharmacist, try giving the individual medication when they’re most open to taking it. If needed, talk to their doctor and pharmacist again to adjust their medications. Then, make the new medication schedule part of their daily routine. People with dementia appreciate and respond well to repetition and structure. After you’ve found a good time of day to give your loved one medication, take a close look at the number of medications they take, how often, and in what forms. If you’re frequently frustrated trying to administer medication, you may find there are options that make the process easier. Consult with your loved one’s doctor and pharmacist about whether there are alternatives to a medication that can cut down the number of times they take it each day. For example, if they are prescribed a medication that needs to be taken four times a day, is there an equivalent that they can take twice a day? Often, there are options for how an individual takes a medication. If your loved one doesn’t like to swallow a pill, ask if the drug comes in other forms, such as a liquid or patch. You also may be able to crush up a pill and put it in a food such as applesauce or pudding. This can make taking it more tolerable. However, still be transparent about this and tell your loved one you are doing this. Also, not all pills should be crushed, so ask the doctor or pharmacist first. One note: Don’t spoil a food they love by mixing in a nasty, bitter medication. If they love ice cream, for example, don’t ruin it for them with a taste they hate. Keep a list of medications and periodically ask your loved one’s doctor and pharmacist to review it. You may find that a medication can be eliminated because it’s no longer necessary or another medication they’re taking does the same thing. Also, take a close look at the over-the-counter medications your loved one takes. I’ve seen individuals who take 20 different nutraceuticals, such as vitamins and minerals. I’m not necessarily opposed to that, but if you’re struggling with a loved one to take medication, ask yourself what’s most important. Can you skip a vitamin to make sure they take something more critical, such as a blood-thinner to reduce the risk of stroke? People with dementia may refuse to take medication if they don’t understand or have forgotten what a medication is for. If they ask about it, offer a simple explanation. Don’t over-explain things because it can potentially heighten the resistance. Person with dementia: I don’t know why I have to take this. You: This will help with your arthritis. Person with dementia: I don’t have arthritis. You: Well, sometimes you have a little knee pain, and this will help with that. One phrase to avoid is, “Do you remember … ?” They likely won’t remember, and it can cause further agitation or they might accuse you of making it up. Not taking medication as directed can have serious health consequences. Managing a medication plan for a loved one with Alzheimer’s or another form of dementia may require more work at times than for individuals with other conditions. But don’t let basic medication safety fall through the cracks. Keep a list of all medications and review it with the doctor and pharmacist: They can assess the dosages and look for potentially dangerous interactions or duplicative medications. Use a pill dispenser: Select a product that is meant to organize medications. Don’t use, for example, an egg carton. It’s not meant for that purpose. Our nurses and caregivers can offer suggestions for a pill dispenser if you need one. Also, set up pill reminders so you never miss a dose. This could be an alarm clock, phone service, or app. Store medicines properly: Some medications may require a special environment, such as refrigeration, but most do best in a cool, dry place. Don’t keep them in your bathroom cabinet, where it is often hot and humid. Also, take care to keep medications away from children, pets, and, if necessary, the person with dementia. If you find yourself struggling to manage your loved one’s medications, it’s OK to ask for help. It can be a tough and, at times, overwhelming job. 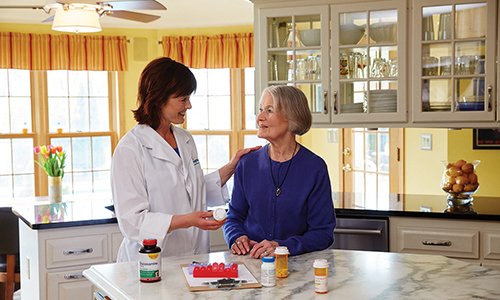 Our nurses can support you by coming to your home to help administer medications, provide education, and guide you to keep your loved one’s health on track. Call 866.618.7827 or contact a BrightStar Care home care agency near you.